The 20 year-old PVC membrane roof was becoming very thin and was subject to sudden leaking. The building is used for high security purposes and leaks could be extremely disruptive and costly. The owner’s concerns included disturbing the current building operations during the roof renovations with noise or odors as well as debris possibly entering the building from removal of the existing roof system. The owner also required a high energy protection from the roof system due to the Vegas climate. Deteriorated walls and ductwork on the roof added to the water tightness concerns. 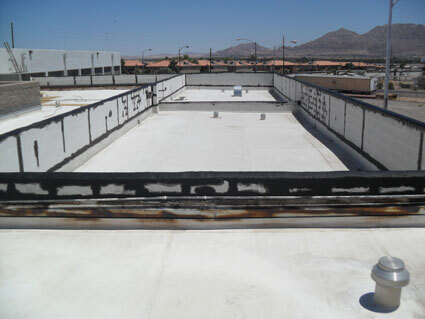 To avoid traditional re-roofing noise and odors, the consultant recommended a restoration of the existing roof system with the TRITOflex liquid rubber membrane system. TRITOflex is an instant-set, water-based, liquid rubber system with no VOC’s. Also recommended was a ceramic white surface coating applied over the liquid rubber membrane to create a thermal barrier to the sun and prevent heat absorption into the building. This suggestion addressed the building’s energy concerns and facilitated a clean, non-obtrusive, and environmentally friendly waterproofing installation.